I love eating new and delicious salads like this Tossed Salad with Tropical Fruit. 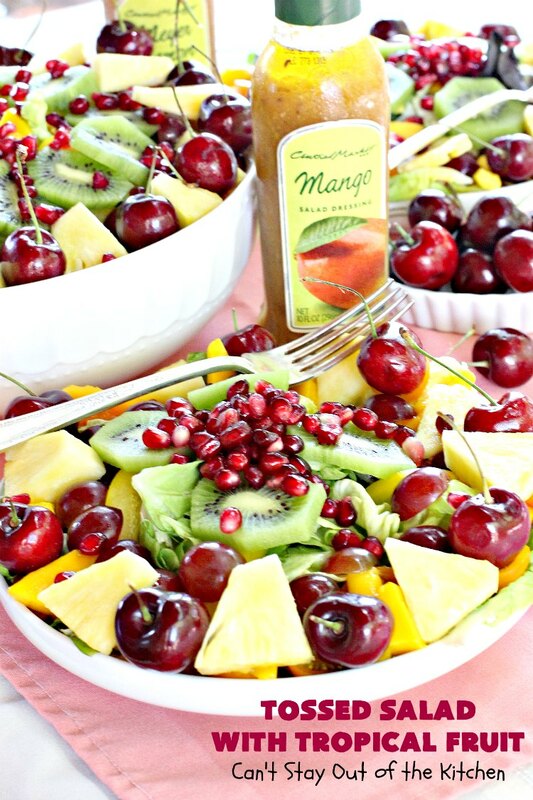 I’ve been thinking about doing this kind of salad ever since I made a luscious Pineapple Mango Salad a few months ago. I love eating tropical fruit and it’s particularly delicious in salad. 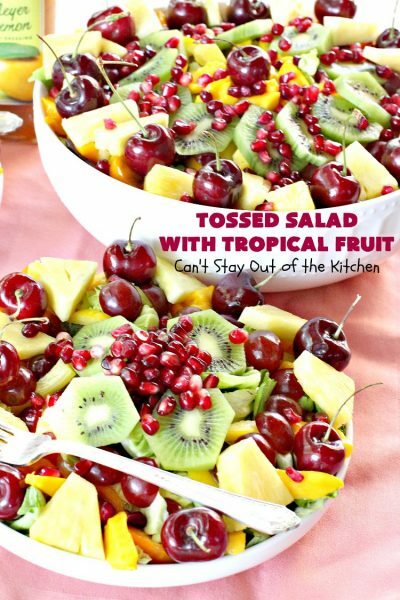 I have so many recipes for tossed salads with fruit: quite a few with strawberries, two with peaches, a couple with pears, several with berries, and all kinds of other combinations that I thought a tossed salad featuring tropical fruit would look gorgeous and taste phenomenal. It did! 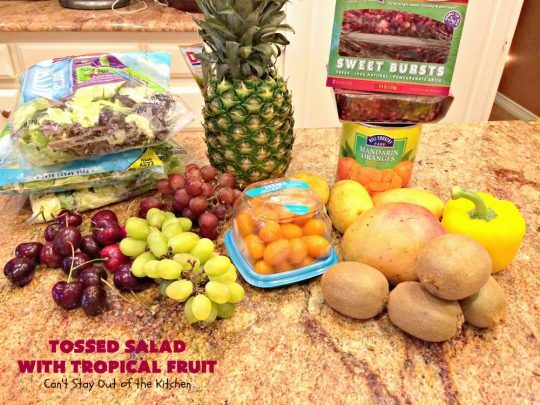 Tossed Salad with Tropical Fruit doesn’t include entirely tropical fruits. I’ve added Zeema sweet orange tomatoes and yellow bell pepper for a little crunch. I left off the red onion since my husband doesn’t care for it. For tropical fruits I used pineapple, champagne or ataulfo mangos, kiwis, and pomegranate arils which all added crunch, texture and lots of intermingling flavors. I included grapes and cherries which aren’t really tropical but look and taste great and happen to be in season. I had so much stuff on the salad I left off the green grapes, regular mango and mandarin oranges because I didn’t need anything else! I also skipped the nuts and cheese this time so this lovely salad is not only gluten free but raw vegan as well. I used store bought mango and Meyer lemon dressings which were tangy, but a sweet poppyseed dressing or a balsamic dressing would work just as well. 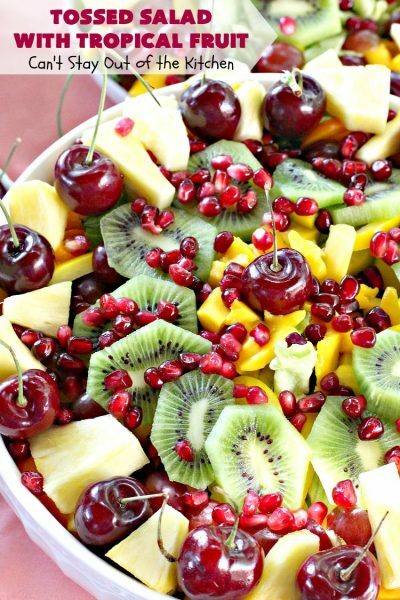 For that matter, this salad has so much wonderful fruit you could even eat it without dressing at all! I found these dressings at H-E-B and they belong to their Central Market collection. I chose these dressings because they are about the closest I could get to a healthy dressing that I didn’t have to make myself. They do include sugar instead of honey but no high fructose corn syrup, MSG or other fillers. 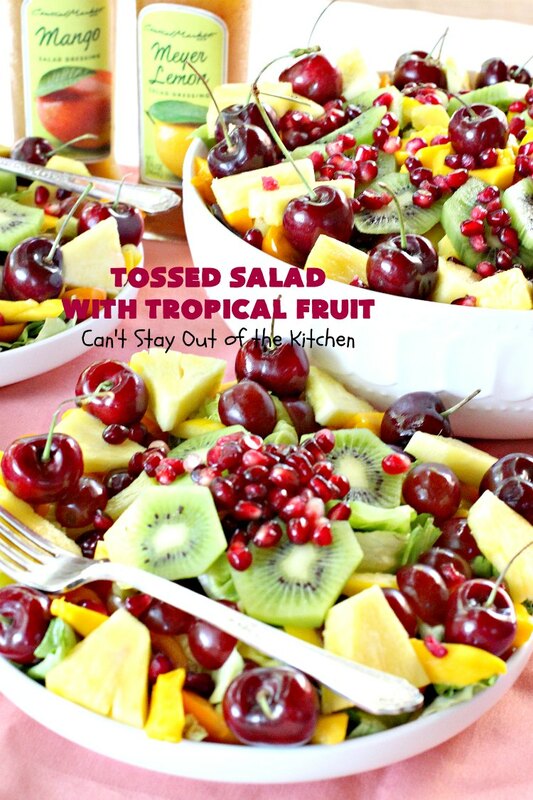 If you’re looking for a sensational “knock-your-socks-off” salad to wow your company, then give this Tossed Salad with Tropical Fruit a try this summer while tropical fruits are in abundance. I actually found the pomegranate arils at Wal-Mart although you can easily find everything else most of the year. Prepare to tantalize your taste buds with this healthy, delicious, low calorie, gluten free and vegan recipe. Tossed Salad with Tropical Fruit is spectacular. Your family will love this salad. If you’re tired of eating the same old salad all the time, then consider this delicious recipe. 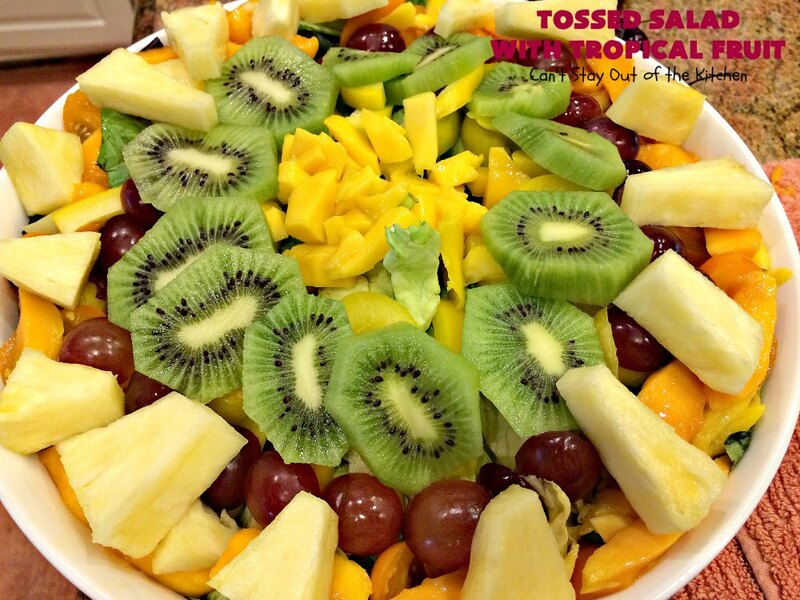 Doesn’t Tossed Salad with Tropical fruit look gorgeous? It tastes wonderful. I started off with these ingredients. I didn’t use the green grapes, large mango, or mandarin orange segments because I had plenty of stuff on the salad already! Add cut fresh pineapple, mangos, sliced kiwis, and red grape halves. 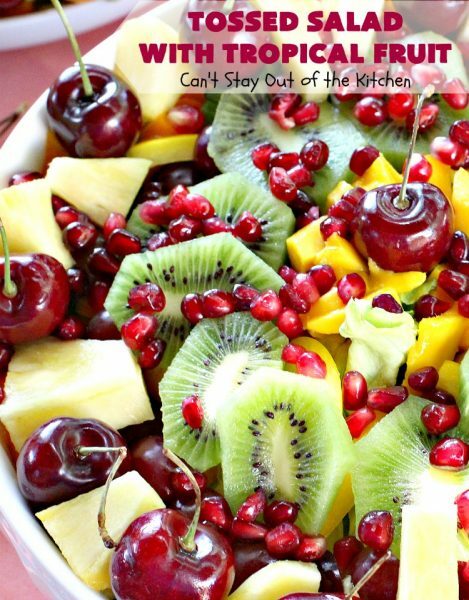 Add whole cherries and pomegranate arils. Refrigerate until ready to serve. 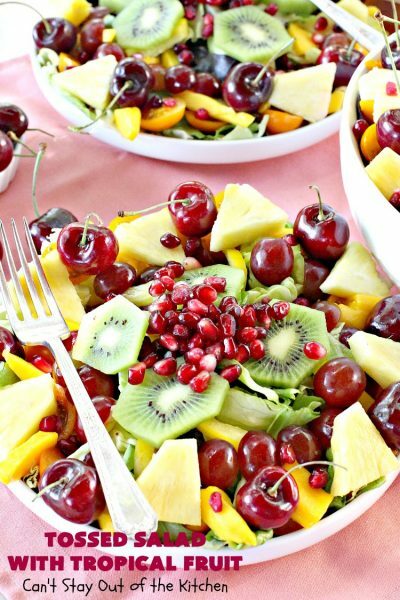 This scrumptious salad is sure to please everyone. It’s perfect for Easter, Mother’s Day, Father’s Day or other summer holidays. This is a great salad to make during those long, hot summer days. 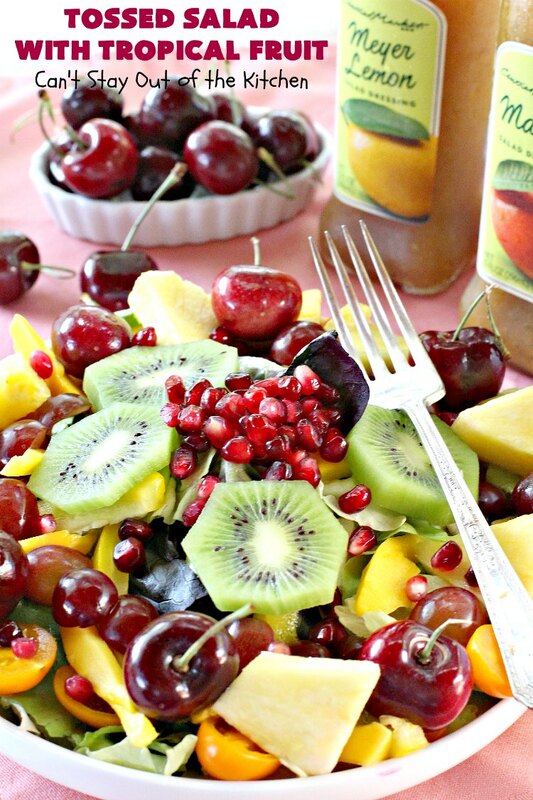 This salad is filled with healthy fruits and even a few veggies! This clean eating recipe is great for company dinners. 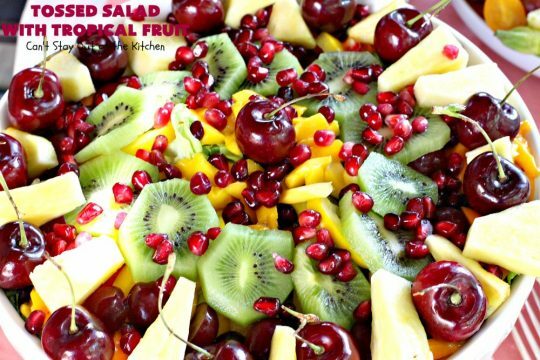 Luscious salad filled with all kinds of tropical fruit. This salad is healthy, low calorie, gluten free and vegan. Layer salad ingredients in order listed. 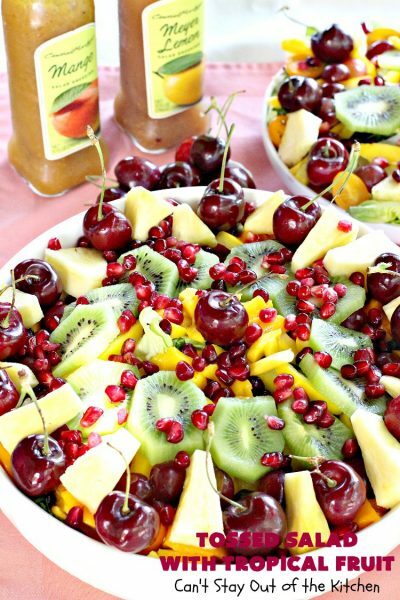 Serve with your favorite poppy seed salad dressing or other dressing. NOTE: Can add mandarin orange segments and almond slices if desired. Serve with your favorite [url href=”http://cantstayoutofthekitchen.com/2014/07/02/healthy-lemon-poppy-seed-dressing/” target=”_blank” title=”healthy lemon poppy seed dressing”]poppy seed salad dressing[/url] or other [url href=”http://cantstayoutofthekitchen.com/2013/05/30/healthy-blueberry-chia-balsamic-vinaigrette/” target=”_blank” title=”healthy blueberry chia balsamic dressing”]dressing[/url]. Can add mandarin orange segments and almond slices if desired. 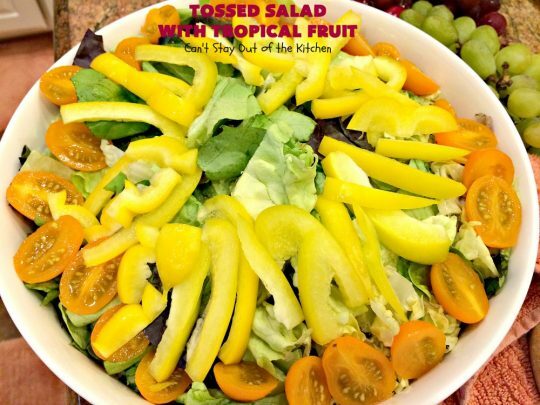 Each mouthful of Tossed Salad with Tropical Fruit is an explosion of delectable flavors. Tossed Salad with Tropical Fruit is healthy, low calorie, gluten free and vegan. What more can you ask of a salad? Time to dig in to this amazing salad.